A sprawling metropolis of almost 9 million people, Mexico city has the highest population in North America. A vibrant and eclectic mix of old, new, modern, traditional, classic and contemporary, it is a city that makes you aware of all of your senses all at once. We didn’t really know what to expect when planning our trip to the city; we had heard and read lots of differing opinions, good and bad. Mexico city turned out to be a vibrant, beautiful, over-whelming city and we really enjoyed our short-but-sweet taste of Mexico. The official colour of Mexico City (CDMX) is pink, and you will see plenty of it, particularly the bright pink official taxis of the city (although we were advised not to use them, they charge tourists notoriously high fares… we walked or used Uber instead). We also saw every other colour you could think of in shops, stalls, murals, buildings, banners and even the plants and flowers. The smog can make it a little hazy and grey some days, but sometimes the smog clears and the sun beats down, exposing the blue sky behind. Zoccalo is the main historic square in the central city, and it’s worth a visit. When we were there, they were getting ready for Mexican Independence Day, so there were red, green and gold ‘Viva la Mexico!’ banners on the building faces and a giant marquee in the middle of the square. This main square is ringed by government buildings, a huge old cathedral and even some Aztec ruins. When we first arrived in Mexico City very early in the morning, we caught a taxi from the airport to our hotel in Zoccalo. It was strangely eerie, like we had gone back in time; the streets were dark and cobbled, and all we could see around us were the looming, shadows of old, stone buildings. Yet when day came, the area transformed into a bustling centre of traffic, tourists, noise, crowds, shops, street vendors, buskers and traffic wardens blowing their shrill whistles. We were there in the off-peak tourism season, so we didn’t notice too many other foreign tourists. Most of the people we saw seemed to be locals, if not from CDMX itself, than from other parts of Mexico. Like any big city, the locals are a mix - business people in suits with briefcases, families with young children, young hipsters with satchels and laptops. Also, akin to many other big cities, the buskers and beggars on the streets - including kids playing guitar and singing along to songs from CoCo, hoping the tourists will fling them a few pesos. 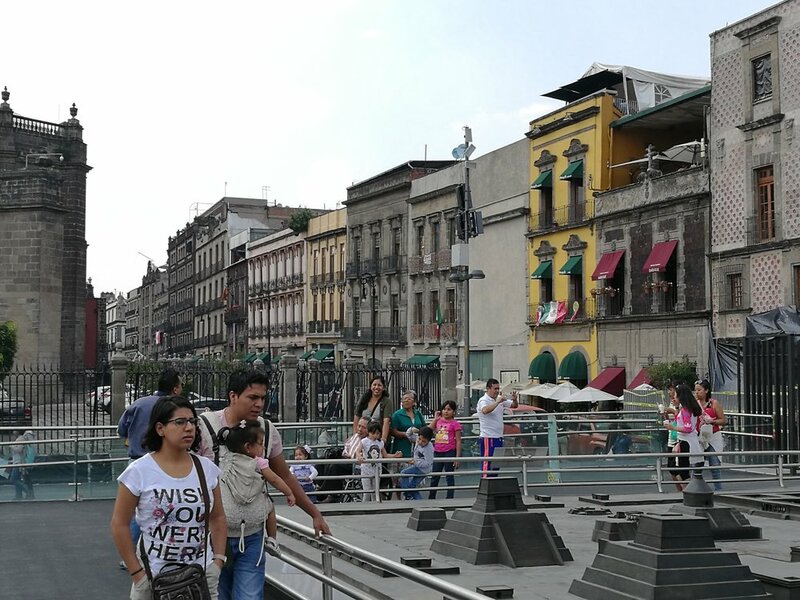 The city has a complex history, and this is evident in the changing architecture, ranging from roman catholic Gothic churches, to the wide and straight Paseo de la Reforma - a whole street running through central CDMX designed after Paris’ Champs Elysees Avenue. The greenery is lush, thanks to the mild climate, but just watch your head if you take the open-air double decker tour bus through the city - you might get thwacked by a lusciously green ,but dangerously low-hanging frond. Art runs through the city like blood through veins, whether it’s in the architecture of the buildings or one of the many murals found throughout the city. The murals tell rich and sometimes brutally honest stories; the artists used them to tell stories about the social and political scene in Mexico over the years, and the hardships they faced. 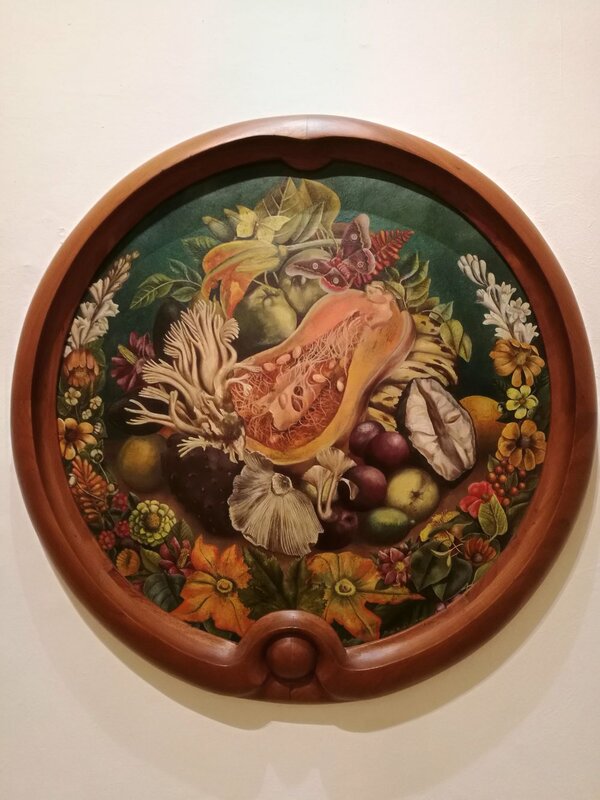 But they also show the things that were important to them; plentiful crops of corn, mothers holding their babies, luscious bunches of flowers and baskets of ripe fruit. 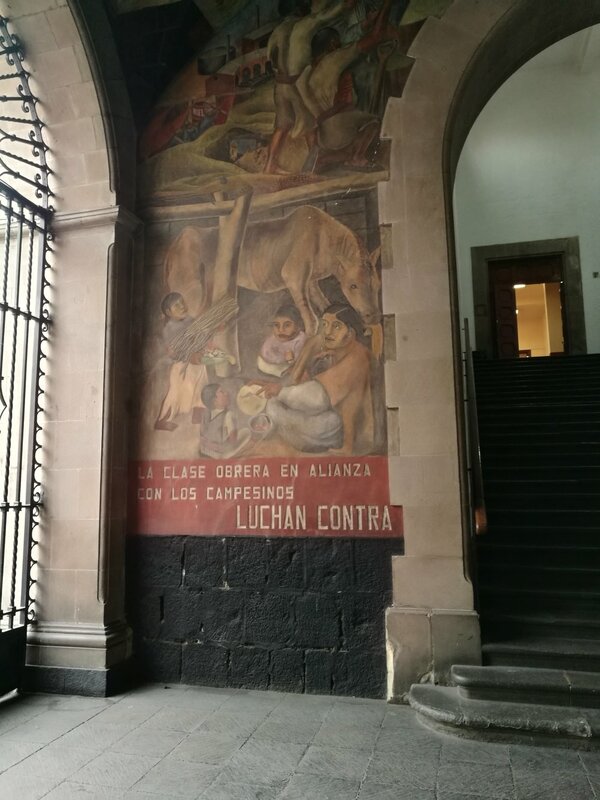 Muralism has a strong history in Mexico city, some of the most famous include those of Diego Rivera, husband of Frida Kahlo. 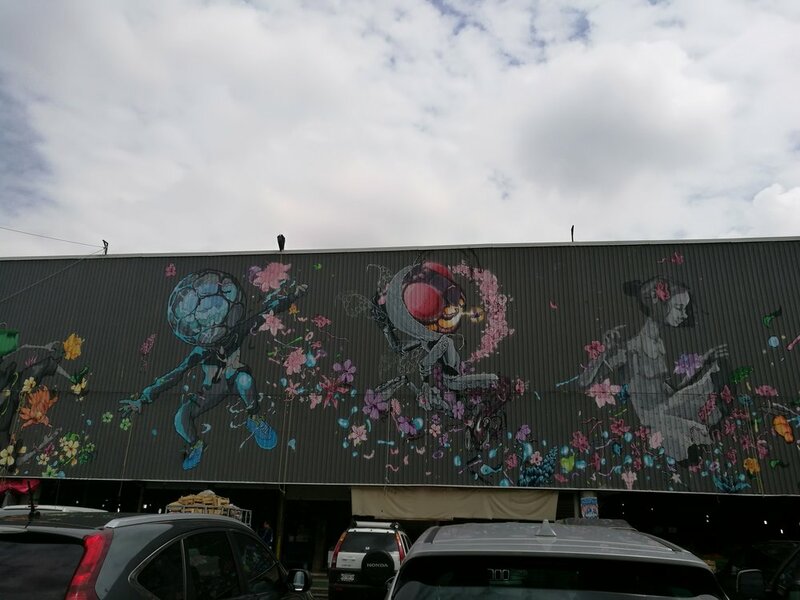 The murals can be found all over the city, some of them in the busy tourist buildings, on rooves and walls of old buildings and markets, down random side streets and many other places, both exposed and hidden. 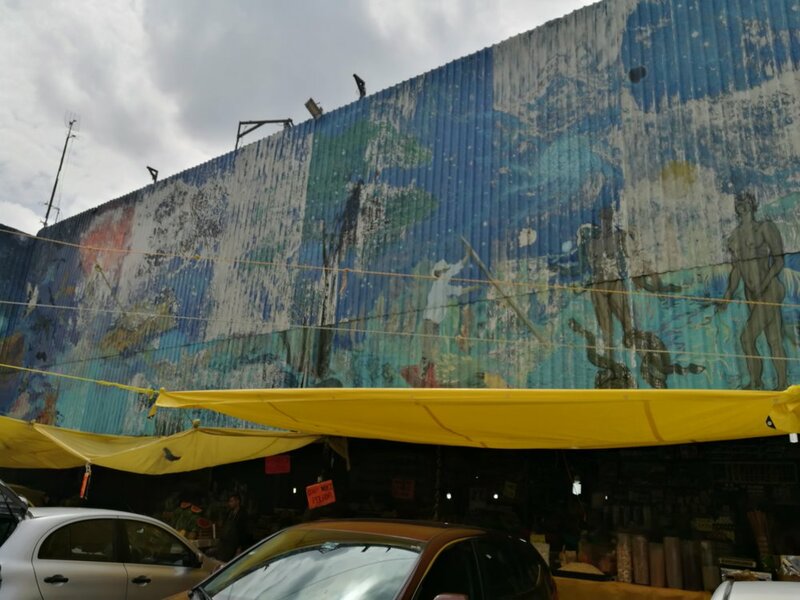 On a Market tour of the city, our lovely tour guide took us behind some fencing at a small market and up a staircase to find murals covering the walls and ceilings. They were honest, and unforgettable. Depicting peasants, starving and hungry, and politicians growing fat on the money taken from the people. There was also a whole mural depicting Nazi Germany WW2, in the stark, ominous colours of black, white, grey and red. We were the only ones there, the place seemed quiet and forgotten compared to other areas of the city filled with people and noise. It was strange to think that behind the hustle and bustle of this busy city, there were places like this where pictures of the past were sitting quietly, waiting for curious eyes to find them. Of course some of the busier tourist spots were still must-sees and worth the waiting in line. 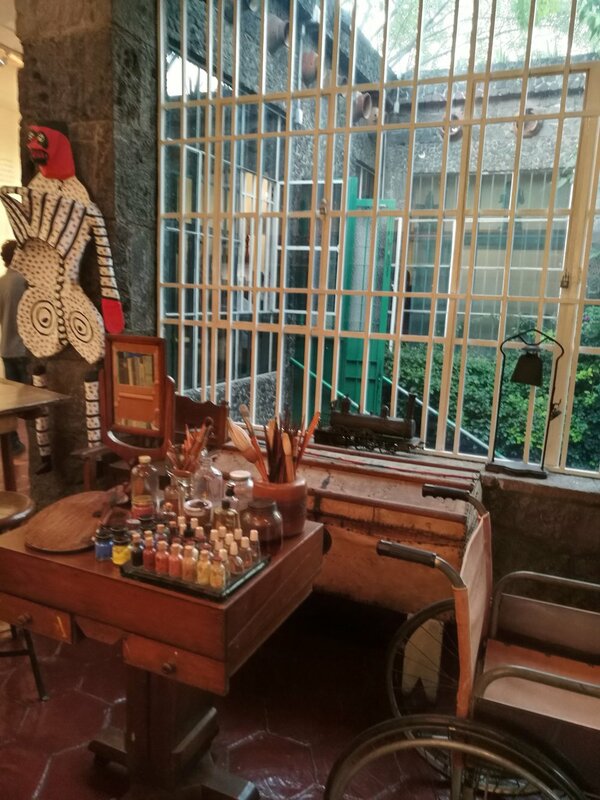 One being the Frida Kahlo museum, which is the house where she and Diego Rivera lived. The house is a collection of quaint buildings that surround a wide, open courtyard with plenty of plants and foliage. 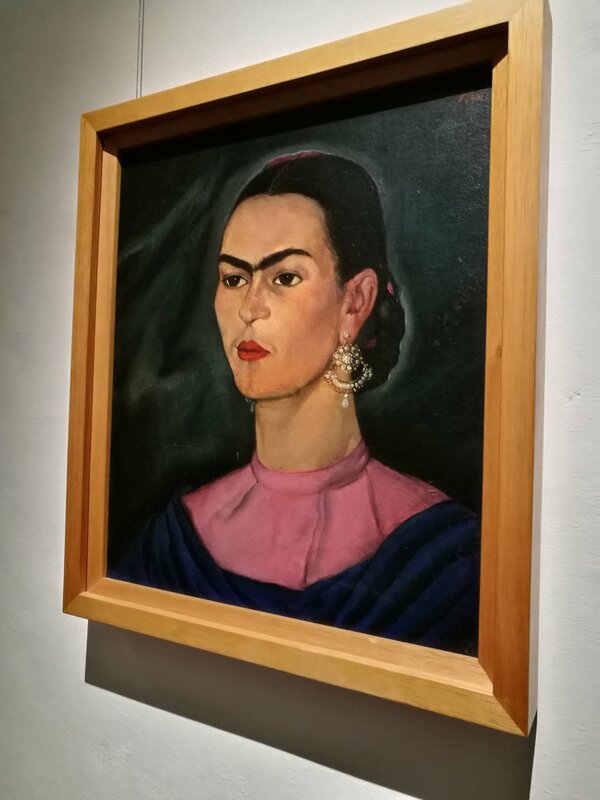 From the walls, to the furniture, the art and even Frida’s belongings, you can see rich array of colours; aquamarine blue, salmon pink, mustard yellow, earthy brown, verdant green and much more. 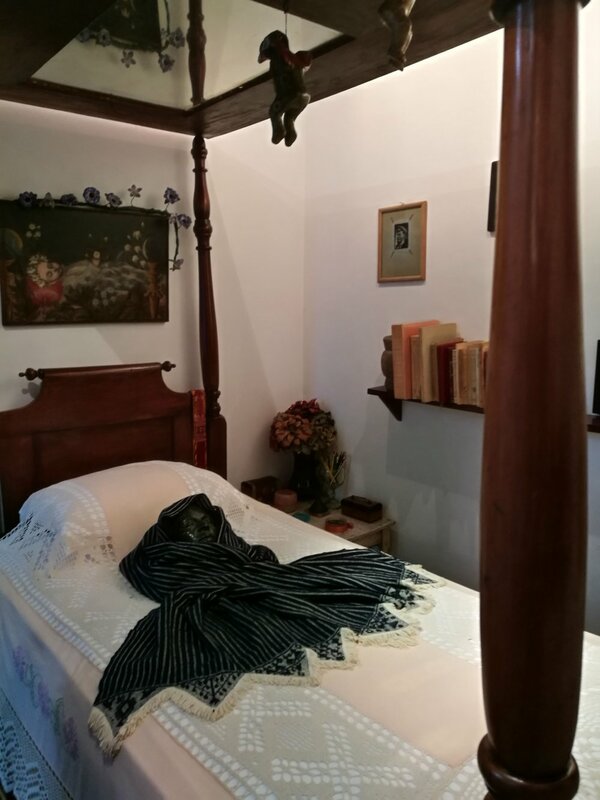 You can walk through the various buildings and and rooms of their house and see some of her works of art, and also the areas she lived and worked in. This includes her work shop, complete with a desk and the materials she used for her artwork, and also her bedroom, where her death cast is lying on her bed. One room also shows her unique and intriguing clothing, including the corsets and support system she wore underneath that helped her body with it’s various pains and disabilities. The nation is a religious one, we saw plenty of statues of various Saints and of Jesus himself. Particularly in the markets; we did a walking tour with a lovely guide who took us to see some of the markets of Mexico City. The Flower market had blooms of every kind and colour. Stalls displayed wreaths and arrangements for many different occasions. The Food markets had many traditional staples of the Mexican diet - including the ‘bread and butter’ of the country: Corn. The produce - lots of vibrant, colourful and deliciously ripe fruits and vegetables. The meat - a little bit different from a butchery window we’re used to seeing, but at least they use every part of the animal. Alongside your usual cuts, there’s plenty of other parts for sale, we saw many a stack of intestines and other things layered up ready to buy. The chickens on sale look strangely yellow - but there is a reason and story behind this. In the past, the chickens in Mexico were corn-fed, which made them turn yellow. However, at some point in history the government realised it was a bit of a waste feeding the chickens corn, which could be better used to feed more people! So they stopped feeding the chickens corn, and instead fed them other grains. However, the chickens started to look different; paler, and no longer had a yellow hue, so the people were quite unsure about buying the chicken meat, as it just didn’t look right to them. So, they started feeding the chickens marigold flowers, which turned the chickens that golden hue once more, but still kept the corn for the people instead of turning it into feed: win win, some would say. We were also taken to the ‘Witches’ market - which did not have potions, cauldrons and ‘Bertie Bott’s Every Flavour Beans’ like we might have expected. Instead, it was mostly herbs and other dried plants which apparently help with different ailments such as respiratory problems, digestion, sleeping and broken hearts. There were also perfumes and soaps that you could buy for yourself or a loved one (or even an enemy) which promised things like fortune, luck, love or bad wishes. There was an area which had animals for sale, though we’re not sure for what purpose and we are relieved we didn’t find out or go to that area - you could smell it throughout the whole market, so we can only assume the conditions weren’t ideal for the poor animals. Some of the more strange and disturbing sights, were the dried skeletons of cats and monkeys, again, not quite sure what they are used for, but we’re okay with not finding out. There were also a few stalls where we could of got our palms read or fortunes told, if we spoke or understood Spanish. 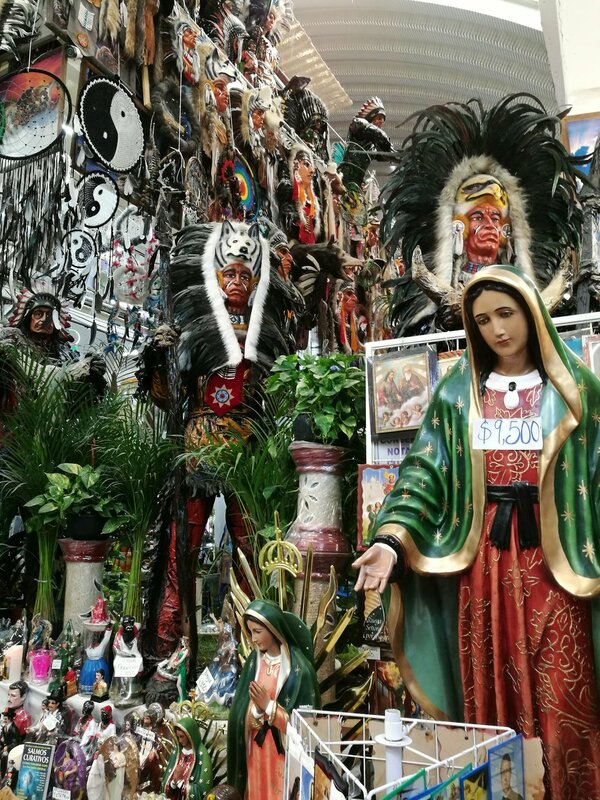 And, yes, plenty of stalls that sold statues of more Saints than I knew existed - including the favourite for Mexican Drug Dealers or for hopeful growers of particular plants, Jesús Malverde, and the controversial cult religion following of Santa Muerte - lady of Death. Not too far out of Mexico city, we visited the pyramids of Teotihuacan, also known as the Sun and Mood pyramid. Standing on top of the Moon pyramid looking towards the Sun, down the alley of the dead - it’s breathtaking. Not only do you get an amazing view of the valley and nearby villages, but you look down at what was once a thriving city and centre of obsidian crafting and realise you are standing on very old stones and in a place so rich in history it’s hard to imagine what went on there. When it comes time to climb the Sun pyramid, looking up at the steep climb to the top is intimidating, but once you’re at the top it’s worth it. Throughout this tourist spot, there are old men selling trinkets and obsidian souvenirs, including a whistle that sounds like a wolf howl. Our visit was part of another day tour, and afterwards we headed to the nearby village of San Francisco Marzapa to visit a family of Obsidian crafters. They were friendly and welcoming, and happy to share their skills and knowledge. They had lots of beautiful obsidian carvings and trinkets on display, and even gave us a taste of Mexican liquor - pulque, mezcal and Tequila. Apparently the correct way to drink it, is salt the lime, squeeze the juice into your mouth, hold it there and follow with the tequila before swallowing it all at once. Delicious! We are also shown a huge agave plant in their back yard, and we learn some of the many uses of this useful plant. After this, our tour takes us to another family business for dinner, where a lady has prepared a delicious, home-style Mexican dinner of fresh tortillas, tortilla soup, rice, meat and vegetables. A simple, yet delicious way to end our tour, before our bus ride back to the city. The city is certainly a feast of visual senses, but it’s also full of noise. Sometimes overwhelmingly so! Near Zoccalo and other busy areas, you can hear the piercing whistles of the local policemen directing traffic, screeching in your ear, but also helpful when telling you when to cross the road. The street vendors and buskers have various things on sale, but a few of them create some sort of honking or kazoo-like noise. The buskers will sometimes have a guitar or music box in hand, and music pours out of shops onto the footpath and streets. The traffic alone can be overwhelming to be a part of; the honking of car horns, cars rattling past, buses, scooters, trucks as well. But they are all masterful in managing to weave in and out and merge in a gridlocked madness. We were told more than once, “if you can drive in Mexico city, you can drive anywhere!” by the locals. We think it might be better to leave it to the locals - just trust the driver and look out the window at the cars and city whizzing by. It’s hard to know what to expect of the food when visiting Mexico; in the Western world we see ‘Mexican’ food as Nachos with sour cream, crispy Tacos, massive burritos with rice and beans, and lots of cheese. But when you visit Mexico, you realise the food is very different from what the Western world has made of it. Corn is a very important staple, you will find it in pretty much every form - even diseased. Along with corn, meat from many different parts of the animals, some rice and beans, vegetables like capsicum/peppers and cactus, fresh fruit and delicious stringy cheese. Salsa exist at mostly every food stall, and plenty of options for sweet treats - Mexicans have a sweet tooth! At the food markets, we tried Corn for breakfast in a couple of different ways - in the form of a Tamale (corn dough with a sweet or savoury filling wrapped in corn husk or banana leaf) or a cup of Atole (a hot, creamy drink made of corn and sometimes flavoured with chocolate). These two dishes are usually taken around Christmastime, but can be found around the city and street markets - a simple, yet filling breakfast that will keep you full all morning. For coffee - there are plenty of options (we’ll talk about that later). Corn tortillas can be bought by the dozen at the local tortilleria; the price is capped by the government, to keep this important, basic food affordable to everyone. On our first day, we arrived early, dropped our bags off at our hotel, then headed straight to meet our tour guides for a street food tour. They took us to a neighbourhood tortilleria and we got to look at the giant tortilla press, the mounds of masa (corn meal dough) and then taste a fresh, hot tortilla. There’s a special technique to rolling it in the palm of your hand, and you can add salt and salsa if you wish. Delicious! Many street vendors and tortillerias will have 2-3 bowls of salsa for you to add to whatever dish they’re selling. Usually one is red, one is green, and they range in spiciness - and colour is not a given guide! Some places the green will be the hotter, sometimes the red, so if you’re up for it, give them a go, they are the most delicious, fresh and zesty salsas you have tasted, just go easy on the drops in case you get the hotter one! We also tried some corn soup at a market, the girl selling it was working for her mother before and after school and was eager to practice speaking English - the corn soups were warm and tasty. Another corn dish we tried a couple of times was the diseased corn. Apparently at one point in history, a fungus/disease came over some of the corn growing, but rather than waste it, Mexico decided that they should still use it and it became a delicacy. It is a grey colour and the ears look a little mishapen. It’s not too bad, it is similar to mushrooms, but we recommend trying in small amounts to start with, as it has a rich flavour. Tacos can be found at many street vendors and stalls, but they are a bit different to Old El Paso or Taco bell. A fresh, soft tortilla, is filled with the filling you choose and then you can top it with one of the aforementioned salsas if you wish. The fillings range from vegetarian friendly options like cheese, vegetable and cactus to meat-based choices, mostly chicken and pork. It is important to mention that they use ALL parts of the animal, so depending on what filling you choose, you will probably get a mix of cuts of meat in there, including the occasional grizzly bit. We were a bit adventurous and even tried the local delicacy of a taco with pig uterus meat inside - it just had a strong pork flavour. But there are plenty of more tamer options also. Aside from tacos, you can get sandwiches, quesadillas and burritos. All have a range of fillings to choose from, and can be topped with salsa if you want. Another popular local flavour that we tried a few times was cactus - we found it had a similar taste and texture to pickled green beans. Apparently it’s full of fibre and quite good for you. After the first few days, we did both get tummy aches, however we don’t believe this is from the preparation or handling of the food, but more so just a culinary shock to the system for our western palates. The food was good, and we tried lots of different things in our first couple of days, but if was different to stuff we usually ate - different cuts of meat, but also a lot of corn, when we are probably used to a more wheat based diet. So next time, we would probably pace ourselves a little better. Another note, is the water - don’t drink it. We had bottled water free at our hotel, so we barely needed to buy any, but it can be found pretty easily and inexpensively around the city. You are also supposed to be careful and use bottled water even when brushing your teeth as well, but we forgot a couple of times and managed to be okay. Mexico seems to have a strong sweet tooth! There are lots of sweets and candies on sale at street vendors, and in shops. We had read about a long-time favourite place that we wanted to visit - El Moro. A churreria, which specialises in churros (delicious Mexican pastries) and divine hot chocolates. We were lucky enough to catch it mid morning on a weekday, so the line wasn’t too busy and we were seated pretty quickly. However, be warned, this place gets very busy in the weekends! It’s a busy, quaint place decorated in blue and white tile, with a view of the kitchen where the churros are being made right before you. Our Español and our servers English weren’t great, but we managed to put an order together. 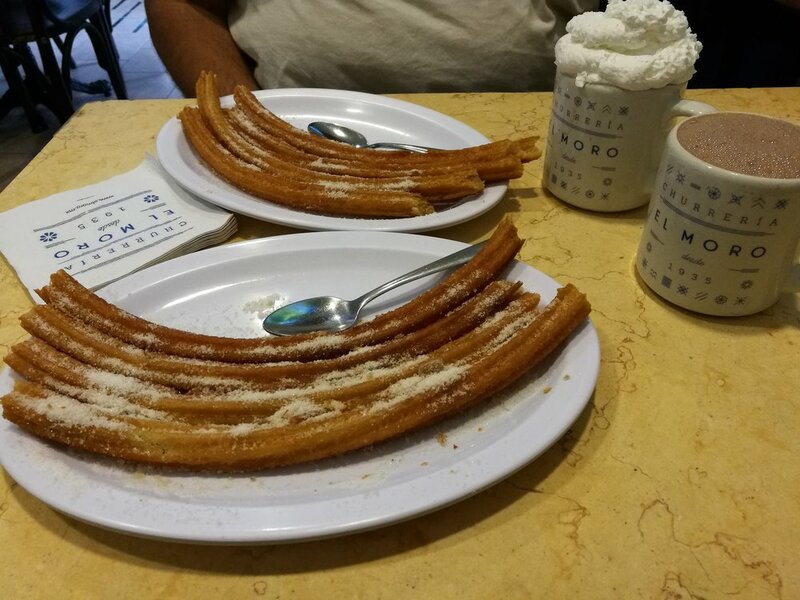 Soon enough, two plates of fresh, hot churros and steaming mugs of hot chocolate were before us. They were delicious! We knew we were going to be facing a sugar overload after, but we didn’t care, sometimes you just have to enjoy the moment! One of the big interests fueling our visit to Mexico city, was the chance to taste the local coffee scene there. Mexico is unique in that the nation mostly drinks mostly coffee grown in the country. 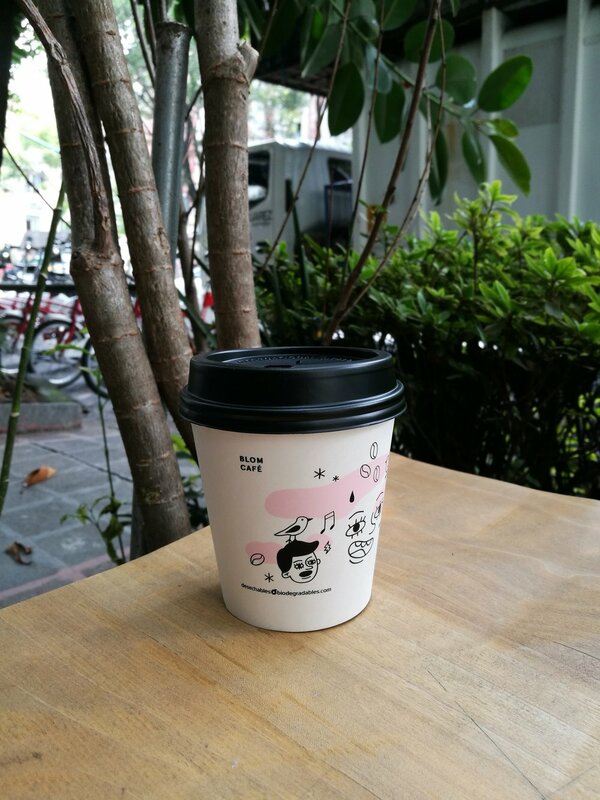 So when you are in a cafe or specialty coffee house, you are drinking something pretty local and likely fresh due to the shorter distance it needs to travel. Like any big spot, Mexico city has a good range of options for coffee drinkers - from the more commercial chains like Starbucks, to the stylish Hipster-esque espresso bars and the more casual local coffee places in between. We tried a good range of the places we wanted to visit, but still feel like there was plenty in and around the city that we didn’t get to. Here is a slideshow of the coffees and places we did manage to visit. While we were there, we also attended a coffee tasting and cupping workshop at Café Borola. We booked this through AirBnB (interested? Check it out here), and it was a great choice. We learnt a lot about tasting coffee and we also learnt how to prepare pour-over coffee. Our host Ricardo was incredibly warm, friendly and knowledgeable not only about coffee but about Mexico city and happy to answer any questions or make recommendations of things to do and places to try coffee around the city. Mexico City is a vibrant, busy city and a great place to visit as a tourist. There were some things about the city that we found we could easily liken to other places around the world we have been to, but plenty more that was very new to us and such an interesting experience. As with many other places around the world, be sure to do your research before visiting and take the necessary steps to ensure you can enjoy your adventures safely and wisely. 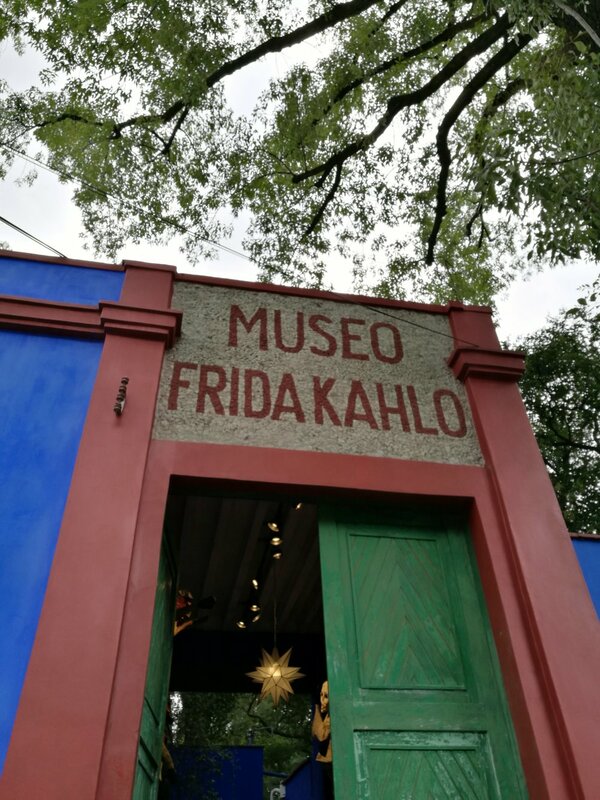 With our limited Spanish (almost zero…), we found day tours with local guides a great way to see, hear and taste some of what Mexico city had to offer, while also feeling comfortable and not out of our depth. Hopefully we can return to Mexico, not only to the big city, but to see more of the country as a whole. Have you every been to Mexico? If you have, let us know how you found it, and if you have any recommendations of other places to visit in the country, we’d love to hear them.